Yes that’s right folks, mayonnaise is paleo, though I would not buy the stuff in jars anymore, have you seen what’s in them!!! Shocking really. Now some of you are probably thinking “Are you serious? Life is too short to make mayonnaise”, well you’re probably right as there is a technique to making it, however the taste is better than anything store bought and you can be 100% sure that what you’re eating is 100% paleo, so guilt free! As I said there is a technique to making this and it does require patience, so I would never recommend making this in a hurry. Don’t worry if it goes wrong the first, second, third or tenth time, keep at it and you will get it. I will tell you how to fix it if it goes wrong as well. The key is patience, add small amounts of oil at a time and to keep whisking. The Preparation to Plate time varies depending on how much oil you add, which in tern dictates the quantity you make. Separate the egg yolk from the white and place the yolk in a bowel (keep the white in the fridge to add to other egg dishes for a bit of extra protein). Add a pinch of salt to the yolk and whisk. Add the mustard to the mix and whisk in until it’s fully incorporated. 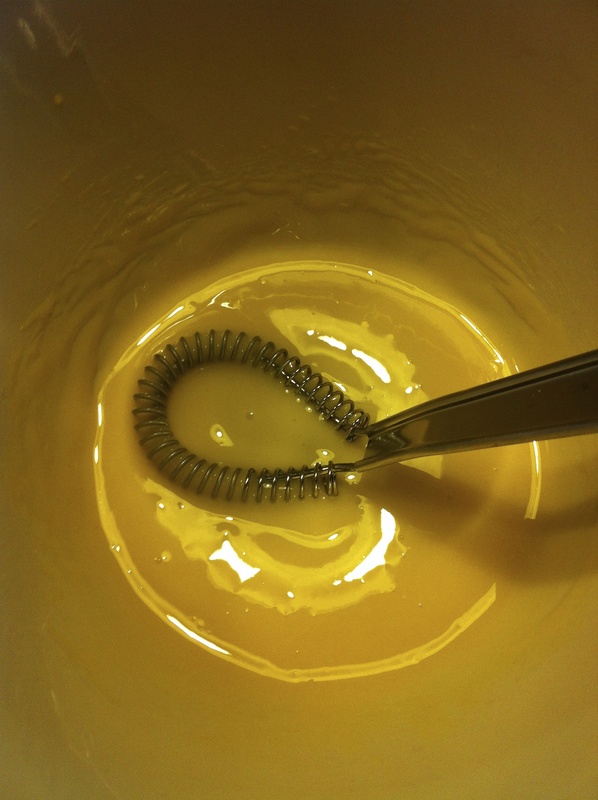 The mustard is not there for taste it is to help the emulsification process, which is how you make mayonnaise with oil and egg yolk. Now starts the long process of adding a small amount (1-1½ tsp approximately) of oil at a time and continue to whisk. You must use the weakest olive oil you can find, extra virgin is far too strong and make the mayonnaise taste soapy. You must not stop whisking until the oil you’ve just added has been encorporated into the yolk. How will you know what this has happened? Well if it’s gone wrong the oil will sit separately on top of the egg and not be able to be incorporated into the yolk. When you whisk it together it should combine fully so that there is no ‘free’ oil left in the bowel. 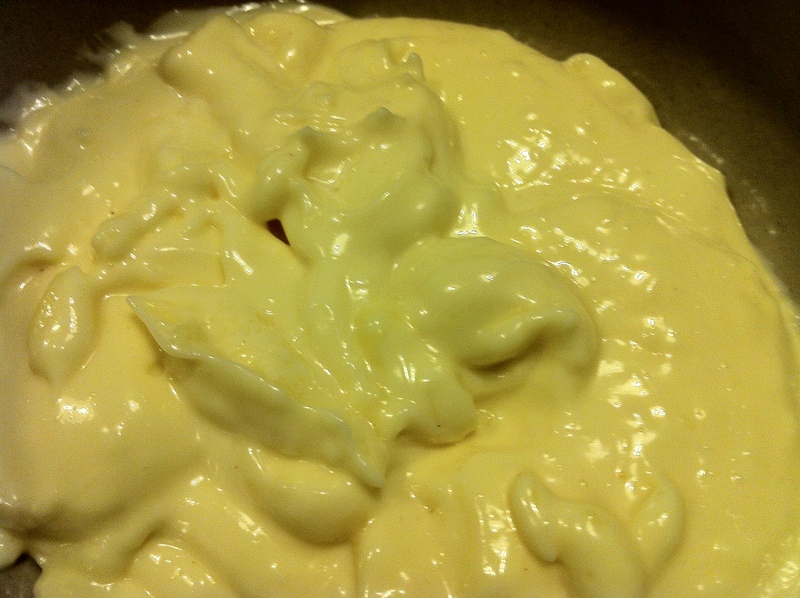 As you keep adding oil you will notice the mixture change in consistency and start to look like mayonnaise. 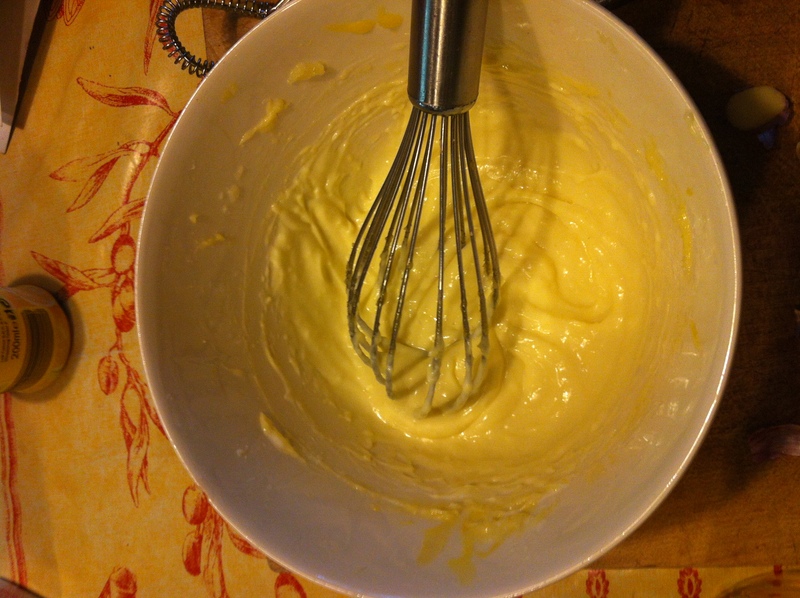 You may also find it easier with a bigger whisk as you progress, I certainly did. If it goes wrong and you add too much oil at one time, don’t panic. You need to start again with a fresh egg yolk following the same steps as before, add a bit of oil to start with and whisk as before. 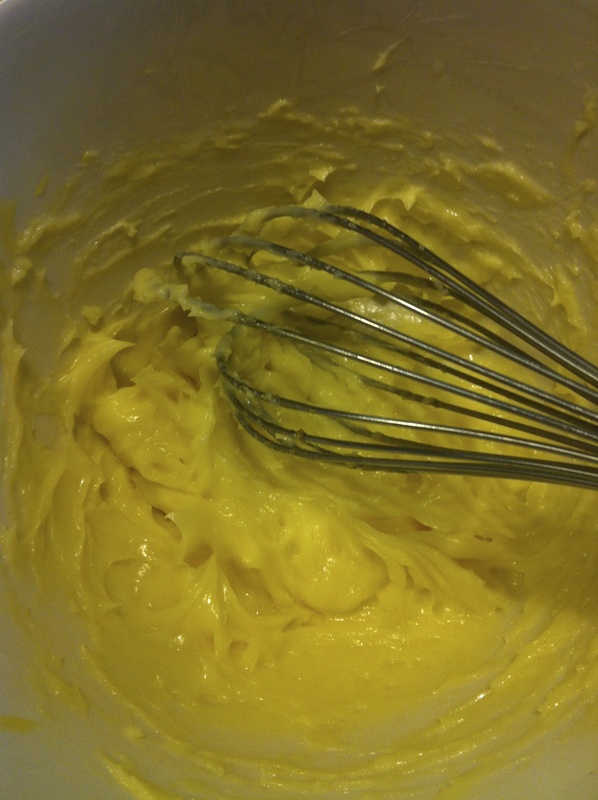 Then add your failed egg yolk and oil to the new batch and whisk together, then carry on adding oil as you did before. Remember less is more, you can always add more oil but you can’t remove it once it’s added. Starting to look like mayonnaise now right? Keep adding a little oil at a time and whisking it in, not adding any more until the last lot has been fulling mixed in. The more oil you add the more mayonnaise you will get. You should, roughly, be able to get about 400mL of oil to combine with one egg yolk, but you don’t need to add 400mL if you don’t want that much mayonnaise. I roughly used about 200mL when I made it. Once you’re nearing the quantity you want, or when you feel that if you add any more oil it’ll fail, then you can add a squeeze of lemon juice, whisking it straight into the mayonnaise. Taste it and see if it needs any more lemon juice or salt. Once it meets your requirements, put into a bowel and serve. I wouldn’t keep this for longer than 2-3 days because it contains raw egg. You can quite easily turn this into garlic mayonnaise which is great with sweet potato fries or seafood, especially prawns. Simply grate half a raw garlic glove into the mayonnaise after you’ve added the lemon juice. The garlic will get stronger the longer it’s in the mayonnaise so the initial taste may not be very strong but it will develop over the next couple of minutes. Believe me less is more here.